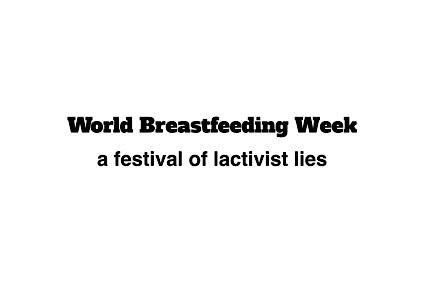 World Breastfeeding Week has sadly devolved into a festival of lactivist lies and WBW 2018 is no exception. Up first is the lie that breastfeeding in the first hour after birth saves lives. It’s worth looking at the lie in detail to understand just how entities like the World Health Organization play fast and loose with the truth in an effort to manipulate women. Like all the best lies, it contains a grain of truth — babies who breastfeed in the first hour are more likely to survive. The problem is the imputation of causation. Babies who breastfeed in the first hour are more likely to survive because only a healthy baby can breastfeed in the first hour. Consider this claim: Patients discharged to home on the day of surgery have a lower death rate than those discharged 2-23 days after surgery. Therefore if we discharge every patient on the day of surgery, we will improve surgical outcomes. That’s ridiculous, right? People who are discharged home on the day of surgery differ in important ways from those discharged later. They are probably healthy to begin with; their surgery was probably simple; they did not experience complications during the surgery. For example, a person who is discharged to home on the day of laparoscopic knee repair has a higher survival rate than a person discharged on day 10 after a heart transplant, but early discharge is NOT the cause. It would be both misleading and irresponsible to claim that early discharge causes improved survival. It would be a lie. Similarly though babies breastfed in the first hour after birth do have a higher survival rate, breastfeeding is NOT the cause. Babies who breastfeed in the first hour after birth differ in important ways from babies who don’t. For example, a baby has to be relatively healthy in order to breastfeed. Babies who have suffered traumatic birth injuries or oxygen deprivation during birth are much less likely to be able to breastfeed within an hour of birth than healthy babies. They are also much less likely to survive than other babies. It’s not because they didn’t breastfeed; it’s because they couldn’t. It’s a perfect example of the axiom that correlation does not equal causation. The sicker the baby, the longer it will be until the first effort at breastfeeding. Hence it is no surprise that the longer it takes before babies breastfeed for the first time, the less likely they are to survive. It’s not because they didn’t breastfeed earlier; it’s because they couldn’t. Mothers who breastfeed in the first hour after birth also have to be relatively healthy. Those suffering from major hemorrhage or pre-eclampsia/eclampsia are much less likely to be able to breastfeed immediately. They are also much less likely to survive and babies whose mothers die are also much less likely to survive. It’s not because those babies didn’t breastfeed earlier; it’s because they couldn’t breastfeed earlier. It’s yet another example of the axiom that correlation does not equal causation. It is important to note that there are many reasons for delayed breastfeeding initiation that may confound the relationship between breastfeeding initiation and mortality. They then ignored that acknowledgement and proceeded inappropriately to draw a conclusion WITHOUT correcting for these confounding variables! There’s another critical reason makes the WHO claim completely misleading. Most of the supporting studies were done in developing countries where mothers often offer traditional prelacteal feeds of water, sweetened water or teas. These prelacteal feeds may consist solely or in part of contaminated water. Those babies are more likely to die not because they didn’t breastfeed earlier, but because they received contaminated water that made them sick. It, too, is an example of the axiom that correlation does not equal causation. But if correlation does not equal causation, what does? The nine facets of the Hill’s Criteria, developed and used to show that tobacco causes lung cancer, can help us determine the difference between correlation and causation. There are two criteria that are particularly important in this case. One is “consideration of alternative explanations.” The papers cited by the WHO did not consider alternative explanations; they selected a preferred explanation and ignored everything else. The other important criterion is “plausible mechanism.” The lactivists at the WHO offer no plausible mechanism by which putting a baby to the breast in the hour after birth could be lifesaving. They make vague allusions to antibodies and skin to skin contact but fail to show that a sip of colostrum or brief contact with a mother’s skin could save a baby’s life. That’s because there’s no such evidence. The lactivists at the WHO view the promotion of breastfeeding as so righteous that they feel justified in deliberately misleading women in order to convince them to breastfeed. They’re wrong. In the first place, the benefits of breastfeeding are trivial. There’s no evidence that formula is dangerous, merely that formula made with contaminated water is dangerous. Second, women are not children to be manipulated with fables. Women are entitled to scientifically accurate information with which to make healthcare decisions. The WHO’s efforts to manipulate women are fundamentally unethical and no possible benefit of breastfeeding justifies unethical behavior on the part of providers. The claim that breastfeeding within the first hour after birth saves lives is nothing more than a lie. It is a deliberate and fundamentally dishonest attempt to manipulate women. Sadly, it is just one of many lactivist lies told by the WHO and other healthcare organizations — involving weak data riddled with confounding variables, imputing causation to correlation and making absurd claims without any plausible mechanism. The truth, a truth that the WHO is loath to admit, is that the benefits of breastfeeding are trivial and that the millions of dollars spent to promote it are a terrible waste of money. My dad liked a quote he picked up from somewhere or other that seems apropos here. “Not exactly lying but careless with the truth.” They’re definitely misleading through a very partial truth. Grrrrr thanks for this, I saw the article with the claim of increased risk of death, published in two places, and it made me see red. The claim that breastfeeding within the first hour after birth saves lives is nothing more than a lie. My problem with it is more that it begs the question: “Saves lives” compared to what? Babies who get nothing to eat in the first hour? Or babies that even have pre-lacteal feedings? You mention that not all prelacteal feedings are beneficial, but I’d like to see that separated out. They act as if the alternative to breastfeeding in the first hour is to starve the baby. In some places, that may be true, but it is certainly not true worldwide, and conclusions based on that presumption do not apply everywhere. It’s similar to how they say that babies doing skin-to-skin are better at regulating their temperature. Compared to what? A baby left wet in the corner of an unheated room? A baby in an 80 deg room who has been dried off and wrapped up? A baby placed under a neonatal warmer set to the perfect temperature? Oh Jesus, is it that time of year again? Gag me.